Park Improvements, Etelä-Haaga, originally uploaded by Brin d’Acier. All summer I’ve been wondering how I would paint this little construction site. It was interesting but somehow bland and uniform. This morning the first red leaves appeared and the problem was solved. Working in the city gardens is a very popular summer job for university students in Helsinki, but the men and women working in this park look like seasoned professionals. All summer as I went by on by bicycle on my way to work, I would see them sitting under that purple parasol, drinking their morning coffee. I couldn’t help but think to the end of the movie “Office Space” and how much nicer it would be to be working outside in the sun, and actually get something real done. 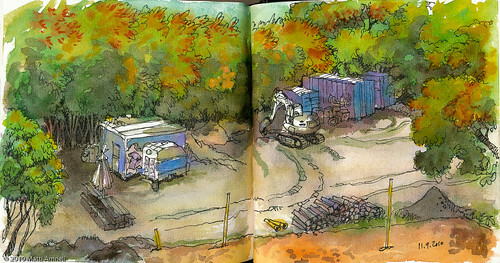 This entry was posted in Sketch of the day, Sketchbook and tagged finland, helsinki, ink, landscape, watercolour. Bookmark the permalink.